Last winter, I traveled through the West of Austria for the very first time. And, just as I expected, I fell in love! Hallstatt Austria is a charming lake town village located between mountains on Lake Hallstatt. 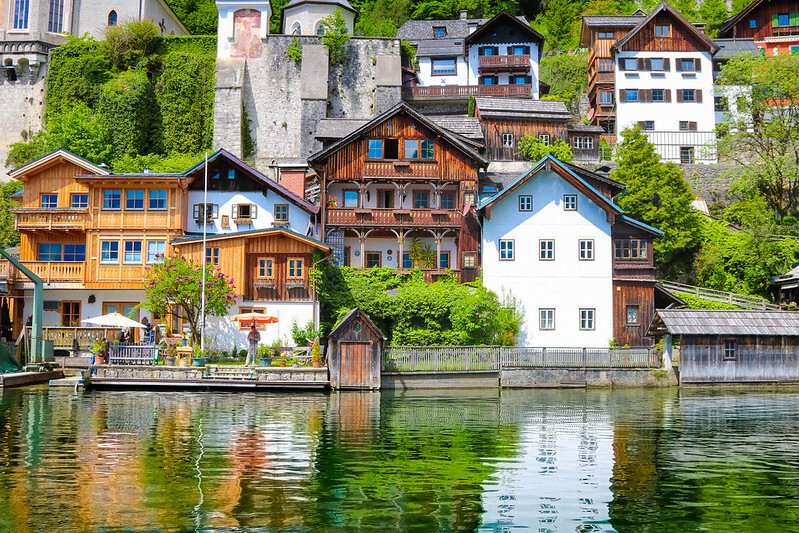 Hallstatt is home to less than 1,000 people and this well preserved town has been named a UNESCO World Heritage Site. I was looking for fairytale destinations around Europe and I found it here in Hallstatt! While I only had a day to visit Hallstatt, it was enough time to get a taste for this famous Lakeside Alpine Village in Austria. Aside from being the most beautiful place in Austria, Hallstatt is more than 7,000 years old and has the oldest salt mine in the world. Here are the 7 places to visit in Hallstatt, Austria! As soon as i stepped down from the bus and saw the painstakingly cute chalets in Hallstatt, I was totally immersed in fairytale world and alpine splendour! I rushed until the end of the town towards the most popular Photo Point and start taking photos from there. Part of the fun is wandering around, gawking at the architecture of this charming town in Hallstatt. Each building looks like something Disneyland created but are still inhibited by locals that have lived there for generations. The stroll only takes about an hour trip, so take your time to stop and snap photos. We very much enjoyed the time we spent wandering the village streets. And for yet another perspective of this quaint alpine town, we headed for the rooftops! One of the famous views of the old village is from the popular Photo Point, and just a short walk away from the Photo Point is where the historic Market Square. The historic Market Square located at the heart of the town and is the major attraction there. This Market Square is really tiny and so, so cute. Its foundations date back to the 14th century, but most of the colourful houses were built during the 16th century. The Church sits in the village centre and is one of the most recognised landmarks in Hallstatt. It was originally built as a house of prayer in the 17th century and rebuilt in the 18th century, as the church you see today. With its charming buildings, cafés and hotels, the village centre is another most popular photography spots in Hallstatt. The most fascinating thing we saw in Hallstatt was the Charnel House or ‘Bone House’. And yes, it’s exactly as weird as it sounds. The charnel house is filled with bones and human skulls. 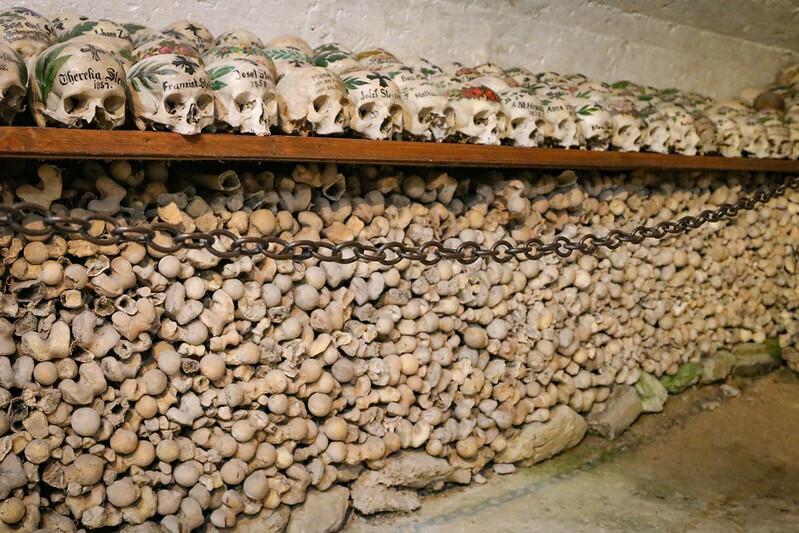 It contains 1,200 skulls and located in the two-storey Michael’s Chapel. The skulls are painted, inscribed with the death date and arranged by family. This tradition started in 1720, due to a lack of space in the church cemetery and no possibility of extending it. Since the graveyard is so small, skeletons are unearthed 10 to 15 years after burial, and moved to the ossuary. The skulls are then clean and decorated with symbols, mostly with flowers. The Museum Hallstatt was opened in 1888 in order to showcase Hallstatt history. 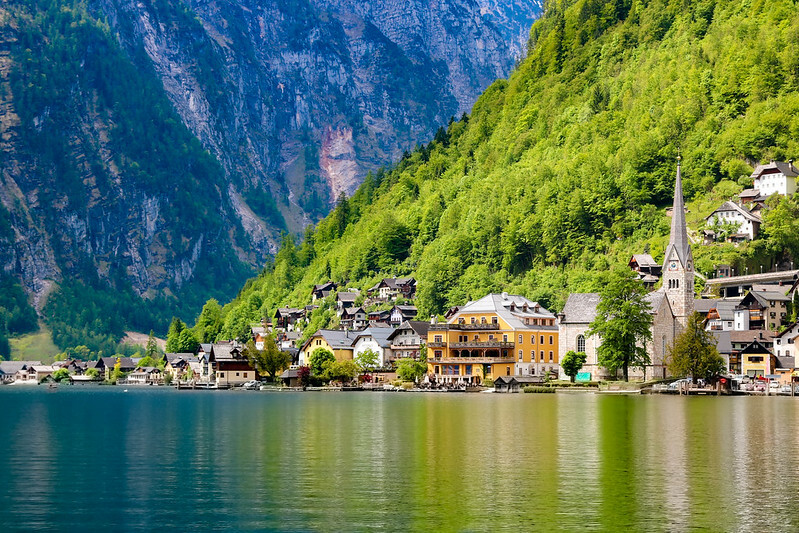 With 7,000 years of history, there is so much to learn and appreciate about Hallstatt’s past. The museum covers everything from prehistoric salt mining to geology, archaeology and culture. It takes you on a journey through Hallstatt’s rich history and influences on Europe and on the world. 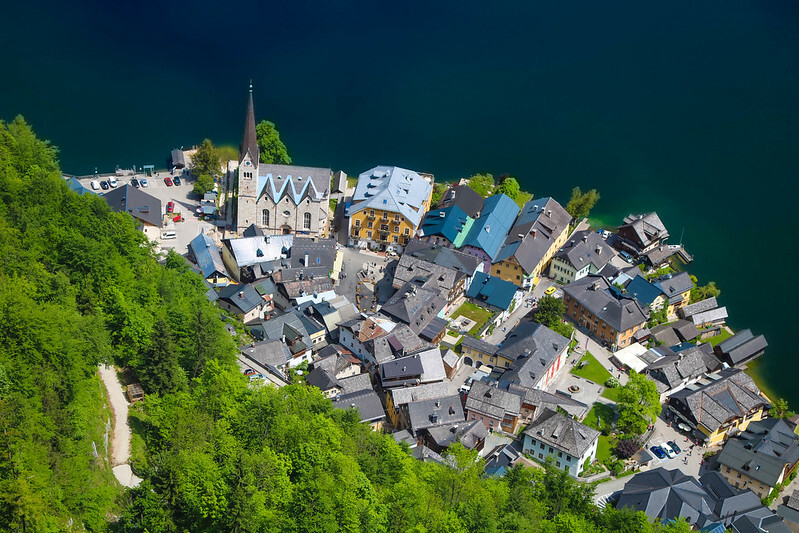 If you are a history enthusiast , you do not want to miss out visiting Museum Hallstatt. If you think the views of Hallstatt are gorgeous from land, just wait until you’re seeing this breathtaking landscape from a boat, gently swaying to the gentle ripples of the Lake Hallstatt. Enjoying the Alps from this perspective is an experience every traveler should add to their adventure bucket list. Renting a boat in Hallstatt and cruising around Lake Hallstatt is completely worth it. Just sitting on the boat and admiring the village, mountains and swans views! Skywalk of Hallstatt is one of the highlights that you shouldn’t miss! It’s not just the viewing platform which is pretty but the entire village of Hallstatt. Every turn of Hallstatt has its own beauty! Ride the funicular up to the mountaintop above town is one of the best experience in Hallstatt where they’ve opened a new panoramic viewpoint. You can walk around on this Skywalk and stand high above the village and the glorious Lake Hallstatt. With postcard shot of glassy lake waters and misty mountains in Hallstatt, it’s well worth the trip either from Salzburg or Vienna! Hallstatt, Austria is easy to visit on a day trip from Salzburg or Vienna. If you leave in the morning, you can get there in a few hours by bus, train and ferry. It might seem complicated at first glance, but I promise, it is very easy. By bus: Take Bus 150 from Salzburg to Bad Ischl. Then change to Bus 542 or 543 towards Gosaumühle/Hallstatt. By train: Take National Railway OBB (Salzburg to Attnang-Puchheim). Then change to the train towards Hallstatt Railway Station. At the train station, take the ferry to Hallstatt port. By train (3hr 22mins): Take the train to Attnang-Puchheim. Then change to the train towards Hallstatt Railway Station. At the train station, take the ferry to Hallstatt port. Have you ever visited Hallstatt? Let me know what was your favourite part of Hallstatt in the comment section below! Seriously cantiknya tempat! 🙂 suka tengok. bila la berpeluang nak pergi ni..
omg, the view. it’s mesmerizing. I’m in love with the view! Tak sempat ke Hallstatt baru ni.. Limited time tapi Austria byk tempat cantik kan.. This is a nice travel blog, I like it very much. This couldnt be Hallstatt.. It’s Paradise! Well written article,tq! I have 5 days in Salzburg & deciding between taking a day trip or staying a night in Hallstatt.